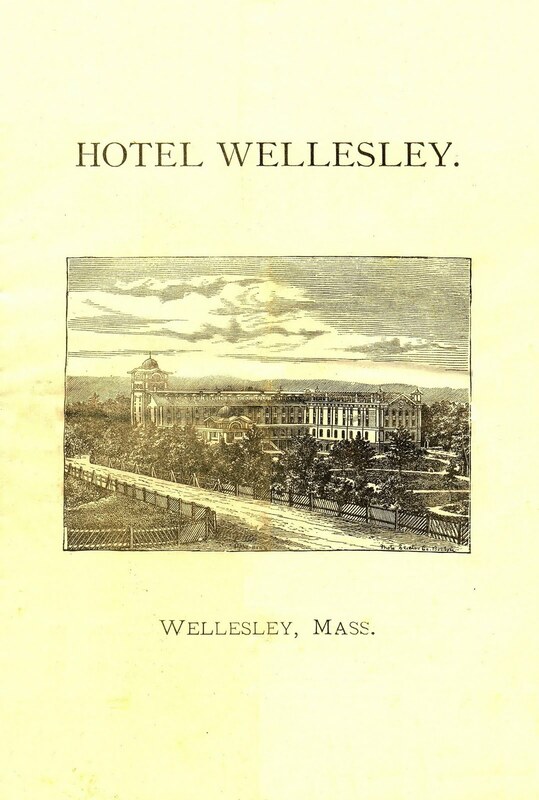 The cover of this 1879 menu from the Wellesley Hotel looks straightforward, except that the small town located a few miles outside Boston was not yet officially named Wellesley; it was still called Needham.1 After making a fortune in sewing machines, William Emerson Baker had first tried to establish a “hygienic village” named Hygeria, where he would conduct scientific work on sanitary food production. 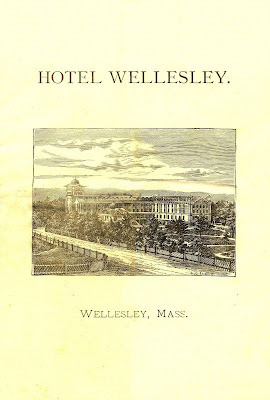 When his proposal was rejected, he simply adopted “Wellesley” as the name of his resort hotel and its location. 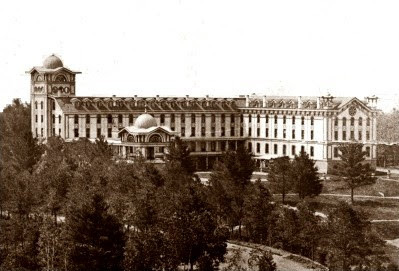 Originally constructed in Philadelphia for the Centennial Exposition in 1876, this hotel was dismantled and rebuilt the following year on Ridge Hill Farm, Baker’s 800-acre estate situated in southwest Needham. 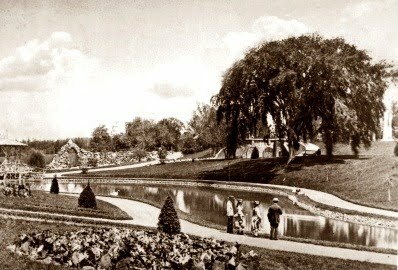 The farm already featured numerous attractions, such as man-made lakes, statue gardens, and a bear pit. What is more, his sanitary piggery was renowned for its cleanliness and the fact that the animals were only fed wholesome food. In addtion to advocating the hygienic farming of livestock, Baker was also passionate about the elimination of food additives and the scientific principles of food preparation. This menu actually has the bill of fare for two dinner that day. One was for the regular table d’hote dinner served at 1:00 P.M. 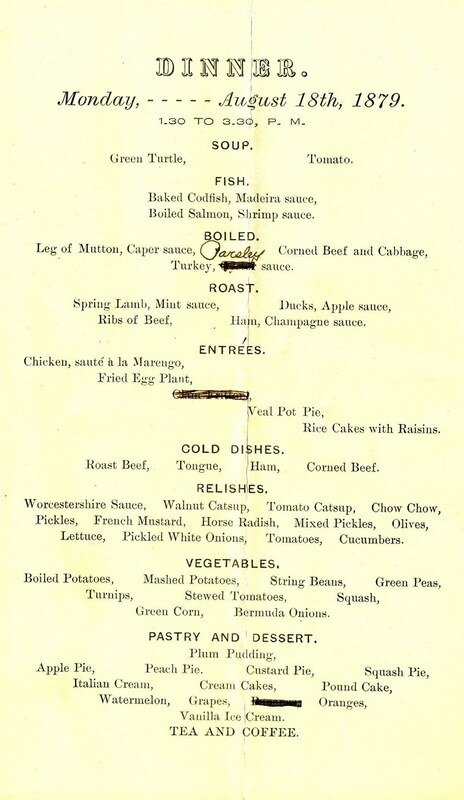 Since there were few regional specialties served at such hotels during the nineteenth century, the dishes on this menu are basically the same as those being served at other hotels throughout the country. 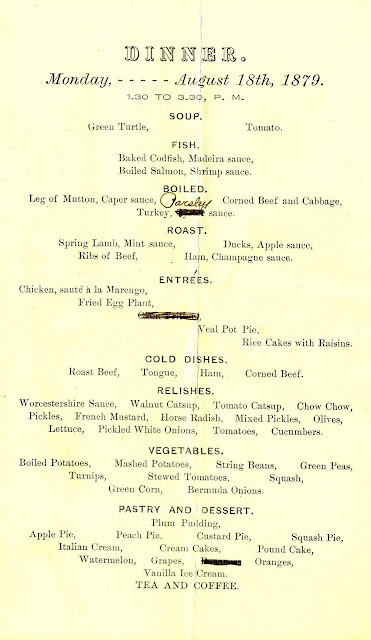 As shown below, the bananas are crossed out, indicating that they were no longer available that day. 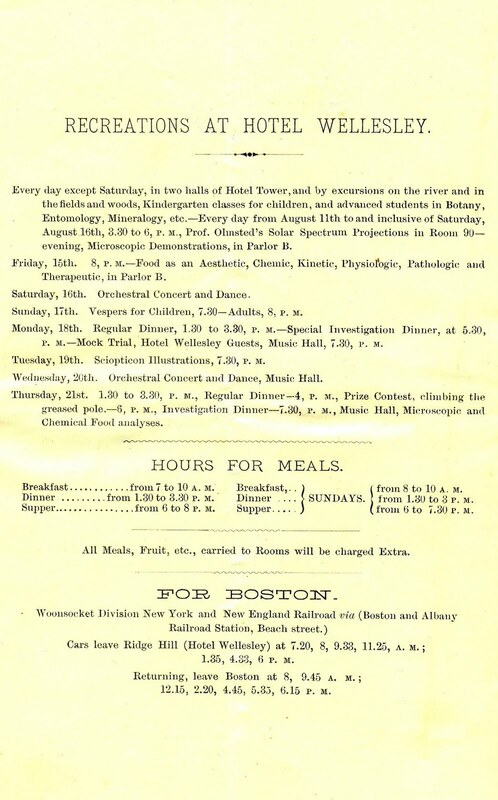 The other menu is for an unusual twelve-course meal called the “Investigation Dinner No. 3” which began at 5:30 PM. A notice informs diners that the dishes would be served in “Lilliput quantities, inviting to the eye and palate.”2 This tasting menu was served at a brisk pace; cornets heralded the arrival of a new dish every ten minutes. One of the so-called "diamond entrees" is stewed kidneys with baked banana and Madeira sauce, suggesting why the hotel ran out of bananas earlier in the day. In fact, this special dinner has a much greater emphasis on fruits and vegetables, evidenced by dishes like the sweet apple and corn oysters, à la Catawba. Some of these dishes are more difficult to define. For example, under the heading “brain culture,” there is an entree named "real artificial fish with lemonizing (sic) dressing." 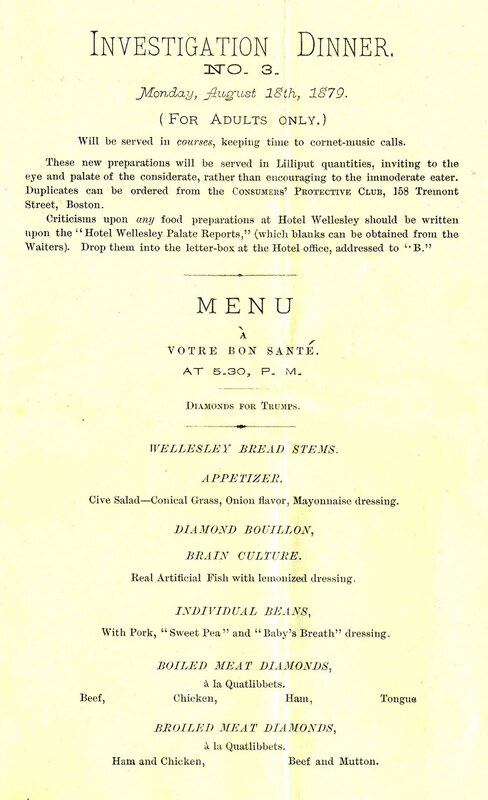 Another curious dish is called broiled meat diamonds, à la quatlibbets (sic). This may have been prepared using a whimsical combination of familiar foods, reflecting Baker's well-known sense of humor. 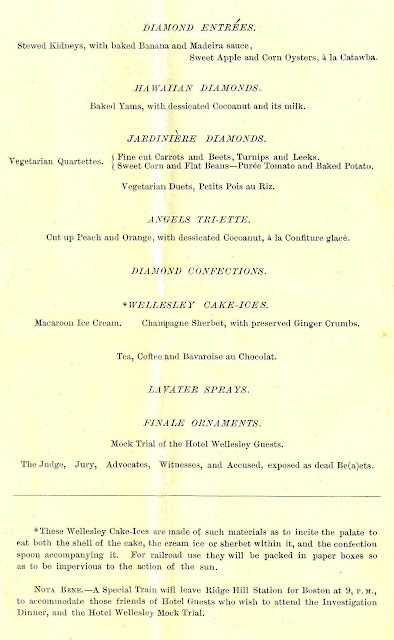 When the guests departed on a special train at 9:00 PM, they took home "Wellesley ice cakes" packed in special paper boxes so they would not melt during the 30-minute ride back to Boston. The recreational activities shown on the back of this menu are much more purposeful than the concerts and dances offered at conventional resort hotels. One example is the microscopic and chemical food analysis scheduled as the after-dinner entertainment on Thursday. The lecture on Friday entitled “Food as an Aesthetic, Chemic, Kinetic, Physiologic, Pathologic and Therapeutic” reflects the wide range of ideas being explored at this hotel. Baker established the Massachusetts Institute of Cookery and the Ridge Hill Laboratories to study and teach his Pure Food principles. Although he was considered an eccentric, Baker was not the only one promoting such ideas. In fact, his interests in public health, women’s education, and scientific methodology were similar to other progressive movements being initiated in and around Boston at this time. In addition, the Boston Cooking School fostered a scientific approach in teaching food preparation and sanitation techniques. 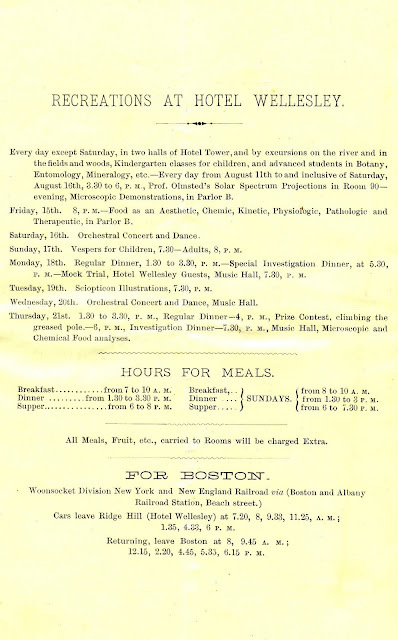 Founded by the Woman’s Education Association of Boston in 1879, this school trained women for professional careers as cooking teachers and experts on proper diet. 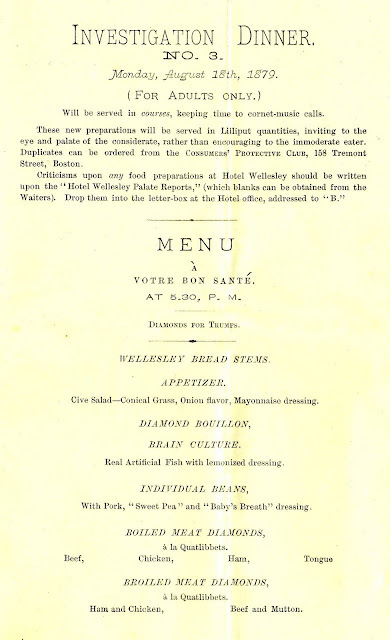 Culinary writer Fannie Farmer completed the two-year program in 1889, and later published The Boston Cooking School Cookbook, still in print after more than a century. Farmer stated in the preface of this classic American reference, “It is my wish that it may not only be looked upon as a compilation of tried and tested recipes, but that it may awaken an interest through its condensed scientific knowledge which will lead to deeper thought and broader study of what to eat.” William Baker could not have said it better himself. 2. The term “Lilliput,” one of the fictional island nations inhabited by tiny people in Jonathan Swift's novel Gulliver’s Travels, was used to describe very small portions. 3. New York Times, 4 January 1880. Like the blog. The name "Wellesley" came from the estate of that name, owned by the Hunnewells. They owned one of the earliest squash courts in the country. This Hotel Wellesley page is not just sick--it is terminally ill! That's my own twisted term of highest praise. Unbelievably interesting. (Full disclosure dept. : I kinda grew up in Wellesley, don'tcha know.) This is an amazing piece of historical research.